Dolly comforts a dove. The Three of Cups represents Grace, that extraordinary blessing by God that we receive and that we then pass on to others. It is gentle, and kind, and overwhelming in its majesty, resulting in the profoundest of gratitude. 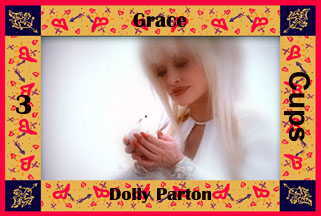 Dolly Parton has grace, has been graced, and emits grace. Graceful Dolly was crooning her lungs out at Dolly Parton.